While the Legionnaires and other heroes tend to C.O.M.P.U.T.O.-caused emergencies, Brainiac 5 comes up with a tactic to stop the rogue computer: frying it with an electromagnetic pulse. Triad makes team assignments, sending Superman into space, the Martian Manhunter to the South Pole with one group of Legionnaires, and Green Lantern and Impulse to the North Pole with the others. Meanwhile, Tiffany Cross follows Apparition into the touchstone, where she finds the half-merged Apparition and Phase. She also discovers their fractured origin: born of a Bgztlian mother and Carggite father, the three babies were separated at birth and raised apart, two of them in a casino controlled by a Luck Lord. One of them (Phase) was traded through time in exchange for a Durlan, who then took Phases shape and was given to a demon, while the third girl looked on. At the South Pole, C.O.M.P.U.T.O./Cosmic Boy surprises the Legionnaires, but Ferro poses as the Weirdo Legionnaire long enough for Iron to escape C.O.M.P.U.T.O.s control. C.O.M.P.U.T.O. almost kills the Martian Manhunter, but Saturn Girl drives it out of Cosmic Boys mind. Cosmic Boy then says that C.O.M.P.U.T.O. is controlling all three Triads. At the North Pole, C.O.M.P.U.T.O. takes control of Impulse and runs the other heroes ragged. In Metropolis, the South pole group meets up with Superboy at the time warp, and Cosmic Boy goes through it, against the orders Superboy was given  is Cosmic Boy still under C.O.M.P.U.T.O.s control? At the North Pole, Apparition and Tiffany Cross come out of Ultra Boys body and surprise C.O.M.P.U.T.O./Triad, but not enough for Supermans electromagnetic pulse to work, and C.O.M.P.U.T.O. uses Tiffany as a hostage. Cosmic Boy arrives with the Legionnaires from the 30th century. Sensor casts an illusion to mix up their apparent powers, keeping C.O.M.P.U.T.O. off guard long enough for a virus to be inserted into it. Dying, C.O.M.P.U.T.O. teleports Brainiac 5 to it, but Superman destroys it before C.O.M.P.U.T.O. can kill Brainiac 5. After a full set of introductions, all the Legionnaires head back to the 30th century, bringing Ferro and Koko with them (much to Brainiac 5s chagrin). 1. Hereafter, Phase is always merged with Apparition, and is only tracked separately should she appear separately. 2. Luck Lords have traditionally been Villains, so this one is listed as such. 3. JLA Mountain next appears next in JLA: World Without Grownups #1, where it is mentioned as having been the Team 20 Legion headquarters, and then later becomes the headquarters for Young Justice. This story occurs after the third story in this issue. 1:1 The big blue whiffle ball is a responsometer, the computer core of the Metal Men. Actual size is about that of a softball. 1:2 The rectangular object is Mother Box. The other two characters are Metron (in his Moebius Chair) and Highfather Izaya. 1:3 Not a very representative image of an Omnicom; they usually have larger screens. 1:4 Note the Galaxy Communications and Daily Planet buildings in 20th century Metropolis. 1:5 This is a non-representational image of C.O.M.P.U.T.O., as the possessed Triad and Cosmic Boy were never merged into a single form like this, and of course C.O.M.P.U.T.O. doesnt plug into the wall. (The white and gray portions of the armor are Platinum and Iron of the Metal Men.) As well, C.O.M.P.U.T.O. only incorporates a single responsometer, which probably explains the apparent miscoloring. 2 This page probably occurs at Metropolis Airport, but it is not identified. It could easily be Boston, Providence, or others in the Northeast, too. 2:Title The title is a riff on the album title OK Computer by Radiohead. 2:3 It is certainly not outside the realm of possibility for the Emerald Eye to be related to the Green Lantern Corps rings, or to the Starheart, although any strong connection to the former would certainly have been researched and commented on by Vril Dox when the 20th century Eye was attached to Garryn and Marijn Bek. 3:3, 3:5 These count as appearances for Impulse. 3:6 The man in the blue jacket is presumably the knife-wielding man from 3:2. 5 The association between the Martian Manhunter and the Legion echoes that from the preboot continuity. 5:3 The symbols on the wall  a makeshift Mission Monitor Board, since C.O.M.P.U.T.O. destroyed the original one in Legion of Super-Heroes v4 #99  has the symbols for Cosmic Boy, Saturn Girl, Spark, Ultra Boy, Ferro (an Fe, the chemical symbol for iron), Triad, Brainiac 5, Gates (presumably; blocked by Superman), Superman, Martian Manhunter (presumed), Green Lantern, Flash, Wonder Woman, and Aquaman. The other two blocked images might be for Apparition or Shvaughn Erin and for Batman; a fifth row of images should be present for Robin, Impulse, and Superboy. C.O.M.P.U.T.O. has presumably knocked out Oracles systems at this point, but the machines Robin is working on are isolated backups of her information. 7:1 Despite the quotation marks, this is not a direct quote from Brainiac 5. 7 Despite the apparent size of the time warp, it is probably reasonably small  large enough for a gravcar or a Legion cruiser, but not the size of a city block  and thus while the risk of things coming through in either direction is present and needs to be guarded against, it isnt severe. 8-9 This issue was dubbed a 100 page special, allegedly the first such issues DC Comics had published in over 20 years. As a result, all page numbering is based on actual pages (although there are only 96 interior pages; the four pages of the cover count for four [although the flyleaf should count for yet another two]), and thus pages 8-9 and other are ad pages, which messes with the apparent page length of the stories. Other mystic artifacts  Dr. Fates amulet, in particular  have been seen to house metaphysical worlds. Is this place inside the touchstone physical or mystical, and is it a property of all Bgztlian touchstones or just Tinyas? This partial merging of Apparition and Phase can presumably only occur in the special place inside the touchstone; it would surely kill them both in the real world. 10:4, 12:1, 12:4, 12:5 The dialogue here counts for both Apparition and Phase. 11:1 There is just a bit of the JOnn JOnzz from the bwah-ha-ha days of Justice League International peeking through here. 11:3 Triad was trained as an administrative assistant, after all. 12:1 How can the conflicting histories be resolved? To start with, each touchstone is presumably tied exclusively to its owner. When Apparition was sent through time, the combination of the shock and the 20th century presence of Phase presumably split the touchstone (at least into two, but perhaps into three, since there were three Tinyas in total). The second one then associated itself to Phase in the timestream and acquired the details of her past; it landed on Earth (since that was the destination of Apparitions touchstone) at the same time Phase appeared on Cairn, where it was acquired by Tommy the Swami. When the two remerged in Legion of Super-Heroes v4 #98, the combined histories came into conflict. 12:5 Just wish you understood it, no? 13:1 This is Tinyas father, Luonel Murl Bordro. He is a Carggite, although Winema did not know that at the time. 13:2 This is Winema Wazzo, probably in her early 20s. 13:4 Murl was a gambling addict. The casino might be on Ventura, or possibly on Summer World. 13:5 Luck Lords seem to run most 30th century gambling establishments. Murl overextended his monies and got severely into debt. 13:7-8 Winema undoubtedly met Murl while off-planet (perhaps as an ambassadorial aide? ); she may have given birth away from home, too. This would explain her not knowing about Tinya splitting at birth, as Bgztlian doctors would certainly have noted the situation and mentioned the missing babies. Indeed, it is most likely that Murl, planning to take two of the children, arranged for Carggite hospital staff: they would not have noted the triplication at birth if they believed the parents were Carggite, and there only being one baby later would indicate natural re-merging of the child rather than an abduction, and thus would not be mentioned to Carggite parents. 13:8-9 Murl took two of his daughters and gave them to the Luck Lord to settle his debt. 13:12 At least one of the stolen Tinyas, maybe both, was raised to be a croupier in the Luck Lords casino. 13:13 The Tinya raised by Winema was educated in Bgztlian schools. 13:15, 13:17, 13:19 The Tinya raised by Winema joined the Legion of Super-Heroes as Apparition. She met Ultra Boy and fell in love with him. She was eventually killed by a rogue Daxamite, although her spirit lived on inside Ultra Boys body. 13:14, 13:18, 13:20, 13:22, 13:23 In order to fulfill some sort of an obligation, but to sidestep it, the Luck Lord took one of the Tinyas it had raised, cast her back through time and switched her with The Durlan from Vril Doxs L.E.G.I.O.N., and forced The Durlan to assume her shape. That Tinya, now amnesiac, joined L.E.G.I.O.N. 13:16, 13:21, 13:24 The Durlan-disguised-as-Tinya was given to a demonic entity of sort. Tinya #3 observed the exchange, but may not have realized the other switch which had also been made. 13 There is no way to tell just when the temporal displacement of Phase and the exchange with the demon seen on this page occur. The rules of coincidence tell us that the exchange with the demon probably occurred simultaneous with Tinyas death in Legionnaires Annual #2. Thus, in the end, we are left with actually four Tinyas: Apparition, Phase, Tinya #3 (who presumably still works for the Luck Lord), and Durlan-Tinya (whose fate is unknown but is surely in jeopardy). The one thing this does settle for certain is that The Durlan is not R.J. Brande. 14:4 This is a flash-forward to an unseen bit between pages 23 and 25. 15 Ferro is wearing the same backpack seen in Action Comics #741. This presumably contains Irons responsometer, among other things. 15:1 This seems a rather odd sled to be using. The Legionnaires could ill afford the amount of time it would require to create it, but having such an item just sitting around also makes little sense. Perhaps it is something that Green Lantern whipped up out of scrap metal; there would be time for that. Buildings in Antarctica are usually not this tall, nor do they have windows, as both are avenues for massive heat loss. 15:2 If it would only take a second, why did an entire team need to be sent out? Dodging the matter that C.O.M.P.U.T.O. suggested it via Triad, the Legionnaires are there in case of an attack by C.O.M.P.U.T.O. 15:3 Note that it is the C.O.M.P.U.T.O./Cosmic Boy who showed up at the South Pole: Saturn Girl has past control issues with him which will limit her effectiveness, and Ferro turns to a metal which is particularly vulnerable to Cosmic Boys powers. Sparks changed powers are still something of a wildcard, so sending her along to deal with the C.O.M.P.U.T.O. body that has innate super powers minimizes any risk she might pose to the other one. 16:3, 17:1 The Weirdo Legionnaire was a guise assumed by Proty II in the preboot in an effort to defeat that eras Computo. A nice bone for the fans, as well as working well both in this story and with Ferros characterization. 17:5 When C.O.M.P.U.T.O. split in Legion of Super-Heroes v4 #99, the Triad/Platinum body had the responsometer and the Cosmic Boy/Iron body had Mother Box. Mother Box is nowhere to be seen now, though. Once C.O.M.P.U.T.O. had been created, the physical objects were possibly no longer required to maintain the creation and became little more than decorative items. Since it shows up on the other C.O.M.P.U.T.O. body in 26:3, it must have been sent there via a Boom Tube as soon as Iron was freed. 18:5 This is just Cosmic Boy, no C.O.M.P.U.T.O. involved. 19:2 Some stories have indicated that the Martian Manhunters vulnerability to fire is largely psychological, by the DC party line seems to be that it acts like kryptonite to Superman or the color yellow to Hal Jordan. 19:3-4 These count as appearances only for Cosmic Boy, C.O.M.P.U.T.O. having been driven out of his mind. 20:1-2 Interesting to see a character with non-physical powers attempting a physical feat. 22:1 Ill never forget you two. Is this an allusion to JOnn becoming R.J. Brande in the 30th century, as some fan theories state? (The particular phrasing of these two being two of the founding Legionnaires is doubly interesting.) By the time of Martian Manhunter #11, JOnn and the Legionnaires have met again, so there is some untold story lingering out there. 22:3 It is possible that she isnt lying. Rather, Carggites have a very low-level interconnection when separated, a sub-telepathy if you will. C.O.M.P.U.T.O. was making use of that, but it is possible that it was able to block out Triads conscious knowledge of her own actions (which would, among other things, prevent Saturn Girl from picking up on the situation). Despite being revealed as in league with C.O.M.P.U.T.O., Triad-Orange and Triad-Purple are controlled, not possessed. 23:1 Okay, this thought balloon would seem to indicate that all three Triads were well aware of what was going on all along. This is the first time we have seen direct thought communication between the Triads, especially at intercontinental distances. Possible C.O.M.P.U.T.O. being in the mix has heightened this ability. 24:1 The sled being towed by the Martian Manhunter carries four, but there are five Legionnaires in this group: Saturn Girl, Spark, Ferro, Cosmic Boy, and Triad-Orange. With the latter controlled by C.O.M.P.U.T.O., they could not risk bringing her along. She has probably been left with either Kitty Faulkner at S.T.A.R. Labs or with the Metropolis S.C.U., or perhaps in a JLA detention cell. 25:1 What it feels like to kill is a theme which will be revisited with Brainiac 4 during Dark Circle Rising, just a few months after this story. 25:3-5 The partially merged Tinya could only exist inside the touchstone. Outside, Apparitions body image took over because it is her emotions which are driving the departure. 25:4 Note that C.O.M.P.U.T.O. has the electromagnetic enhancer rod. Gates apparently had it in 23:2. 26:3 That is the electromagnetic enhancer rod in C.O.M.P.U.T.O.s hand. Mother Box can be seen on C.O.M.P.U.T.O.s armor here, and more clearly in 30:1 and 32:1. 27:1 Tiffany presumably came out of the touchstone along with Apparition/Phase. If we dont worry about how she went in, we shouldnt worry about how she came out. This counts as an appearance for Impulse. 27:3 Dialogue is from Green Lantern. 27:7 The sound effect is from the Legion cruiser. 28 This has got to be one of the most uplifting scenes in the entire Team 20 storyline. Is Apparitions arm phasing through her hair? Note that MOnel is not present. First, some Legionnaire would have had to be left in the 30th century to deal with any emergencies that came up while the others went to the 20th century, but more importantly, his earlier self was already present in the 20th century, in the Stasis Zone. It isnt clear what would have happened had he tried to accompany the rest of the team to the past. 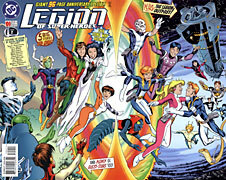 29:5 Team 20 met the new Legionnaires in Legion of Super-Heroes v4 #< > and Legionnaires #< >. Magno has since lost his powers and left the team, and Monstress has joined. Note the flight ring on Cosmic Boys hand. He got a new one in the 30th century. 30:1 Sensor has made the illusion of everyones powers switching. Live Wire and Umbra are switched, as are Kinetix and Leviathan, XS, and Invisible Kid, and Star Boy and Element Lad. Sensor is using Cosmic Boys powers while he is apparently doing nothing, but that would be the power effect of illusion casting. Monstress is using Chameleons powers, but Reep is not seen in this panel, possibly because Monstress powers (strength) dont have a visual effect. If C.O.M.P.U.T.O. was not in this panel, this would be a rather significant crotch shot for Kinetix. Initial indications might be that Sensor has switched the appearances of the Legionnaires, causing C.O.M.P.U.T.O. to think the powers come from others, but 31:1-2 indicates that she has redirected the power effect location on characters like Live Wire and Umbra. The characters who have physical effects  Leviathan, Chameleon, Invisible Kid, and such  probably are disguised as one another, however. 31:3-4 Radio dialogue is from Brainiac 5. 32:1 C.O.M.P.U.T.O. is using a Boom Tube. 32:1-2 Note that C.O.M.P.U.T.O. has summoned its creator, an interesting parallel to the human urge to make peace with God on our own deathbed. Ergo, C.O.M.P.U.T.O. knows it is dying. 32:5 JOnn and the other Legionnaires presumably fetched Triad-Orange as soon as Cosmic Boy came back through the time warp. The silhouettes are Sensor, Live Wire, Monstress, Chameleon, and XS. 34-35 The rest of the Metal Men are seen here. They were presumably kept busy with the various effects of C.O.M.P.U.T.O. along with the Justice Leaguers who were not seen. Recall Supermans confusion of Spark for Lightning Lad back in Legion of Super-Heroes v4 #<86>. Taptree is crying because he has lost his friend, Phase. And maybe because he knows Dox will throw a fit when he comes back without her. It isnt clear why Mercury has tumors all over him. Perhaps he is boiling mad? Kinetix hasnt been totally cured of her lust for artifacts of power. Shes probably heard about Green Lantern rings, but since they apparently no longer exist in the 30th century (as confirmed in Green Lantern v2 #97-99), she has never had the chance to see one. Wouldnt it have been better for Element Lad to observe Leads spirit as golden? They he would not only be making a reference to Gold, the deceased former leader of the Metal Men, but he would also be being an alchemist, turning Lead into Gold. Even Brainy realizes his limits and problems. Inferno staying in the 20th century may be somewhat balanced when Ferro goes to the 30th. Sensor is knowledgeable about 20th century Terran superheroes? Very odd. 36:1 Worogs is perhaps the postboot version of the Nine Planets Ice Cream Parlor. 36:4 Dialogue is from Cosmic Boy.